Thanks to quirks of the calendar and the narrowing technological gap between the devices in our pockets and those lingering under our TVs, the latest instalment of the Uncharted action-adventure series arrives barely two months after we reviewed the last one, Drake's Deception, and doesn't look all that different. Even by the Call of Duty-regurgitating, never-knowingly-not-a-sequel standards of the modern video games industry, that's an impressive rate of iteration. The difference, of course, is that Uncharted: Golden Abyss is one of the first games to be released for PlayStation Vita, and while the timing is perhaps unfortunate - even when Vita reaches Europe in late February, Drake's Deception will be barely four months old - you can understand the choice of talisman. If anybody is going to convince sceptical gamers that Sony's new handheld can deliver premium-quality gaming on the go, then surely it is Nathan Drake. With original developer Naughty Dog sticking to the PS3 for the time being, Drake's latest fate is thrust into the hands of Sony's Bend Studio, and the team best known for the Syphon Filter games proves a fastidious steward, carefully ticking all the right boxes over the game's six-to-eight hour lifespan. There's a reluctant love interest, double crosses, fossils and relics galore, and an ancient city of gold to be found by jumping, shooting and dangling through jungles and ruins across South America. The dual-stick controls are new to handhelds but familiar to every console owner since PlayStation 2, and although the symbol and shoulder buttons are micro-switched rather than analogue (meaning you click them rather than depressing by degrees) that doesn't make much difference here, so the experience of controlling Drake is immediately comfortable and intuitive. Drake's range of actions is much the same too. He jogs around, jumps heroically across ravines as required, and moves smoothly over rock faces, vines and walls between convenient networks of recessed handholds. When he comes across enemies - Uncharted games are always infested with identikit hired goons with little to differentiate them, and Golden Abyss is no exception - he can either hide from view and use stealth attacks to incapacitate them, or use cover-based third-person shooting to wipe them all out. "For perhaps the first time, this is an Uncharted adventure you may replay to find things you missed." Golden Abyss is even faithful to its predecessors' eccentricities, which are both a blessing and a curse. On the one hand it means that if a guard spots you - even if you eliminate him before he can say anything - then everyone in the vicinity will be aware of your location and reinforcements will appear from nowhere, hurling grenades with unerring accuracy to flush you into the open. On the other hand, it means that you can knock someone out in plain view of another guard's patrol route and he won't bat an eyelid, which is actually as useful as it is stupid. In other areas, however, Golden Abyss is forced to deviate from its master's script. Vita is no slouch visually, allowing the developers to frame Drake in the vast and evocative comfort of twinkling chasms, mountains, rainforests and forgotten civilisations as he shimmies across a ledge or hangs from a creaky old beam, but it can't hope to match the extraordinary technical accomplishments of the plane sequence in Drake's Deception or Uncharted 2's ice caves. Nor does the engine seem quite so comfortable with moving parts, slowing to a chug with half a dozen enemies on screen in a complex location, and the pool of different environments is shallow. As a result, the extremely heavy scripting of the last PS3 game - which rarely allowed you to probe beyond the borders of the carefully managed visual effects spectacle to which you were party - is generally absent. The developers' compromise has been to highlight usable handholds, ropes and other means of progression with a shimmer of light and a lick of gold paint, which is a more traditional means of guiding your progress, but one that leaves you free to pick your own way through your surroundings and - gasp - even explore! Gallery: Snapping photos using Drake's camera is one of many ways Sony Bend uses the Vita's range of control options to mix things up. Sony Bend has also been tempted (or perhaps bludgeoned) into embracing the Vita's touch-screen and rear touch panel, but it has generally been careful not to replace any expected and understood functionality with novelty waggles and gestures. So while you can drag your finger across a sequence of ledges for Drake to then scramble across, this remains optional (an option I generally exercised when I needed to scratch my nose, incidentally). The big exception is stealth takedowns and melee fights, which must be performed with a touch-screen tap, but this proves just as comfortable as hitting a button. Instead - perhaps aware that gamers suddenly freed to wander around may actually do so - the developers have injected the majority of the mandatory new-fangled control ideas into the margins of a world we never previously explored. So now, in addition to occasionally picking up glittering relics in nooks and crannies, Drake can also collect charcoal rubbings (rubbed out on the touch-screen), slice through bamboo (using your finger as a machete) and generally rotate, drag and wipe anything he finds lying around. When can I play Uncharted Vita? Uncharted: Golden Abyss will be released in Europe alongside PlayStation Vita on 22nd February 2012, so you can play it then. If you absolutely cannot wait, you can import a Japanese Vita and Uncharted from various places online. The system can be set to English language during initial setup, and Uncharted is completely in English (menus, voiceovers, everything) after you do this. Vita is also region-free, which is handy, but unlike PS3 it is bound to a single PlayStation Network ID, so if you use your existing account you won't be able to buy content online until February when the European store opens. The alternative is to set up a Japanese account (trivial using guides on YouTube) and buy stuff on the store using pre-paid PSN cards (available from the likes of Play-Asia.com), but you will be stuck with the Japanese Store after that unless you wipe your machine, losing any save games in the process. Content cannot be transferred from one PSN account to another. Look out for our full PlayStation Vita Hardware Review very soon. You're also on the lookout for a selection of picturesque views to capture with Drake's camera, which uses a mixture of buttons, gyroscope and god knows what else to orientate itself. It's all basic stuff, and the environments aren't exactly open-world, but the inclusion of little hidden paths and diversions and the use of unusual control methods inject welcome variation into a previously repetitive formula. 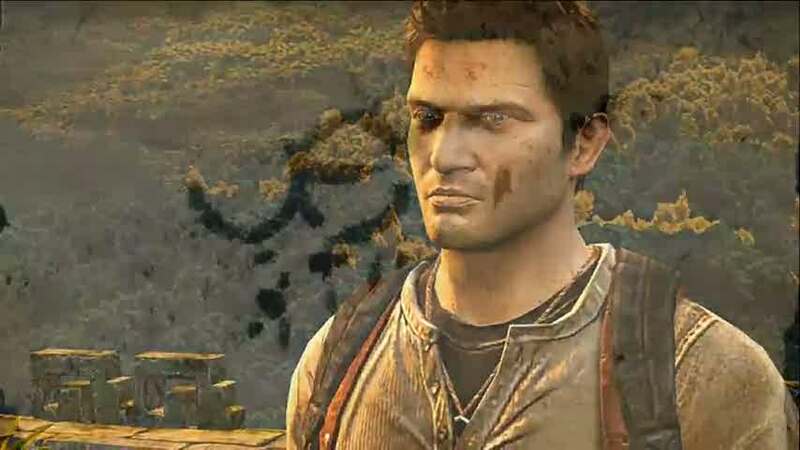 For perhaps the first time, this is an Uncharted adventure you may replay to find things you missed. The story is much better when it sticks to the likable characters and their motives rather than the history lessons, and it generally improves the longer the game continues, although the standard of writing varies from touching peaks to some things that probably ought to have been cut (most notably a long-running "that's what she said" joke sequence during a boat ride into the jungle). Uncharted: Golden Abyss was never likely to match its home console relatives for scale and spectacle, so it's a shame it does only a fair job of emulating the tone and balance of Naughty Dog's writers in an area where it could have been extremely competitive. And while Golden Abyss is more relaxed about player agency than its predecessors, this is still never a difficult game, nor one that leaves you much to figure out. Drake's journal began life in this series as a tool you needed to examine and decipher in order to make progress, but has since been demoted, and in Golden Abyss it's largely a means of counting your winnings and making sure you haven't missed any photo opportunities. It's not really Sony Bend's job to stop this dumbing down, of course, but equally that doesn't mean it should go unacknowledged. We shouldn't be too harsh on Sony Bend, however, because for the vast majority of the time, Golden Abyss is a cleverly constructed game that more than justifies its addition to a series already lathered in superlatives. While the absence of multiplayer means it won't last you as long as previous instalments, new control options have allowed the developers to line the seams of Drake's adventure with flashy tassels and detailing that make for a varied and entertaining outing - perhaps even more so than its big brothers. At the very least, that should solidify Sony Bend's reputation as a trustworthy custodian for PlayStation's growing pile of first-party treasures.